Brite/brown adipose tissue (BAT) is a thermogenic tissue able to dissipate energy via non-shivering thermogenesis. It is naturally activated by cold and has been demonstrated to increase thermogenic capacity, elevate energy expenditure, and to ultimately contribute to fat mass reduction. Thus, it emerges as novel therapeutic concept for pharmacological intervention in obesity and other metabolic disorders. 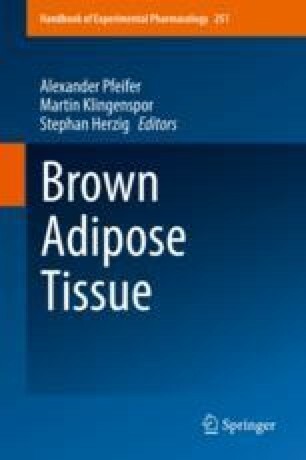 Therefore, the comprehensive understanding of the regulatory network in thermogenic adipocytes is in demand. The surprising findings that (1) all human protein-coding genes make up not more than 2% of our genome, (2) organismal complexity goes well along with the percentage of nonprotein-coding sequences, and that (3) three quarters of our genome are pervasively transcribed, provide evidence that noncoding RNAs (ncRNAs) are not junk, but a significant and even predominant part of our transcriptome representing a treasure chest worth retrieving regulatory determinants in biological processes and diseases. In this chapter, the impact of regulatory small and long ncRNAs (lncRNAs) in particular microRNAs and lncRNAs on BAT formation and metabolic function and their involvement in physiological and pathological conditions has been reviewed.